More than three weeks after back-to-back hurricanes Irma and Maria tore through the Caribbean Islands, leaving a trail of devastation and human suffering, Puerto Rico is still in a state of emergency. As we go to press, 85% of the island is still without power, 60% without telecommunications, 50% of the island does not have access to clean water, and sewage treatment facilities have been severely damaged or do not have electricity to operate. Full power is not projected to be restored until March 2018. For many of the more than 3.4 million U.S. citizens living on the island, life is a daily struggle for food, medicine, clean water and fuel for cooking and generators. Getting a clear assessment of the economic damage and loss of life has only been made more difficult due to the collapse of communications and transportation infrastructure, leaving significant parts of the island totally isolated, cut off from the outside world. On top of the human suffering, the long-term economic impacts have not even really registered yet. An estimated 80% of the year’s agricultural production was wiped out by the storms, and initial estimates of overall damage are as high as $95 billion, nearly equivalent to Puerto Rico’s annual GDP. An estimated 48 people have died as a result of the storm, and the numbers of dead and injured will likely rise as communications come back an online and emergency crews are able to reach isolated areas. Anecdotal stories are trickling in from the interior of rural hospitals without power, clean water or air-conditioning, full of sick patients festering in the tropical heat, posing a grave risk of further fatalities. The magnitude of the disaster is hard to fully absorb. According to press reports, even seasoned FEMA and other federal personnel were stunned at the extent of the devastation. The storm had essentially wiped out the island’s administrative infrastructure and there were few government services on the ground for the initial assessment teams to work with. However it cannot be said that the scale of potential damage was unanticipated. In the days before Maria hit, the governor released a statement that the hurricane would “essentially devastate most of the island,” that had already suffered from $1 billion worth of damage from Hurricane Irma. Puerto Rico’s power company predicted that between Irma and Maria nearly 100% of the electrical grid would be destroyed. Other utilities issued similar warnings ahead of the storm. The avoidance of an even greater tragedy in terms of deaths and injuries can be partially attributed to the emergency steps taken by ordinary working people and local authorities in preparation for the storm. Shelters were set up across the island and evacuations conducted to the best of the capacity of the already strained local government services that were still cleaning up from hurricane Irma. And what was the response from the White House? The initial federal response was slow and wholly inadequate. While Hurricane Maria was tearing the island apart, President Trump took four days off to go golfing at one of his private resorts, attended an election rally in Alabama, and ranted about NFL players taking a knee. As concern mounted over the abysmal federal response, Trump went on the defensive, adding to his twitter woes by bragging about his administration’s performance and trying to deflect from his mistakes by blaming the Puerto Rican people for “not working hard enough” and “accumulating too much debt.” This disastrous reaction by Trump quickly unnerved the political establishment, worried that Maria and Puerto Rico could become “Trump’s Katrina” – a reference to the political fallout from Hurricane Katrina in 2005 that flooded and devastated New Orleans and permanently damaged the Bush administration. These fears were quickly exacerbated during Trump’s public battle with the Mayor of San Juan who made a televised public appeal for help and criticized the failed federal response. Containers full of relief supplies have been piling up on the docks and airports with local authorities unable to properly organize distribution due to the collapse of the infrastructure and a shortage of trained workers. Initial delivery of aid was also delayed because the banking system was shut down and residents could not get cash to pay for basic necessities – necessities that should instead be distributed based on need. Instead the ‘free market’ continued to ration aid in the midst of a deep crisis with water, fuel, food, generators, and medicine ‘distributed’ based on an individual’s ability to pay cash for desperately needed supplies. Given the accurate predictions of grave damage facing Puerto Rico there is no reason that federal relief efforts could not have been effectively pre-planned and pre-positioned to provide a rapid response. The shipping restrictions of the Jones Act could have been waived in advance, as they were for Florida, before Irma hit. The federal government should have been ready to step into the breach, filling in with basic transportation, communications technology, skilled personnel, shipping, helicopters and truck drivers. As the wealthiest nation in human history, there is no reason U.S. authorities could not overcome “logistical difficulties” to deliver needed aid to Puerto Rico. Instead Trump tweeted, vacillated, and threw blame and paper towels while people were struggling and dying. In contrast to the failed initial federal response, several national labor unions have organized volunteers to assist the recovery, with over 200 union members – truck drivers, skilled tradespeople and healthcare workers – traveling to Puerto Rico to provide basic support. While scientists hesitate to draw a direct causal link between any given hurricane and climate change, there is broad agreement that global warming increases the intensity of hurricanes and other extreme weather, with radically increased rainfall and overpowering winds causing increased damage to cities especially in coastal areas. Hurricanes Irma and Maria are among the most powerful storms to ever hit the United States and the 2017 hurricane season is one of the busiest on record. With 10 hurricanes already, this year has tied 1893 for the greatest number of hurricanes in one season since records began in 1851; and there is still more than a month of the season left to go. Since 1991, 5 of the top 10 most active seasons have been recorded. Hurricane Harvey flooded Houston in August, setting a new U.S. rainfall record in dumping 27 trillion gallons of water on Texas and Louisiana. 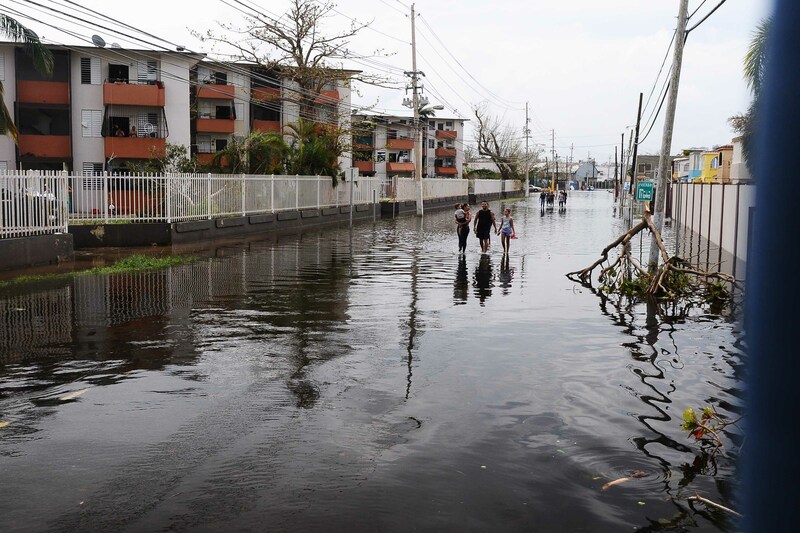 On top of the cleanup of direct storm damage, Puerto Rico is at further risk from 23 EPA toxic Superfund sites left over from unregulated industrial development, including huge piles of coal ash loaded with chemicals and heavy metals. The storm winds and rains have potentially distributed this toxic mess all over the island. Vieques Island, off the coast of Puerto Rico, was used for target practice by the US military for decades, resulting in widespread contamination which may now have been dredged up by the storm. As part of President Clinton’s federal budget “balancing” in 1996, changes were made to the tax code that effectively shifted revenues from Puerto Rico to the federal government, leaving gaping holes in Puerto Rico’s budget. With payment of public debt required by the Puerto Rican constitution, guaranteed on behalf of brutal colonial interests, the government began severely cutting public services, wages and pensions, raising taxes, closing schools, laying off public workers, and privatizing the telecommunications network. These attempts to impose austerity met with determined resistance, and over the past two decades we’ve seen militant struggles of the Puerto Rican working class: teachers, public workers, utility workers, and students fighting for their pensions, for their jobs, for their unions, for their communities, and for their schools – fighting back against the attempts to make the Puerto Rican working class pay for the $70 billion of public debt accumulated by vicious neoliberal policies. But the years of recession and unemployment, of class struggle and disinvestment, are taking their toll. An estimated 400,000 residents have left the island over the past 5 years looking to escape the economic crisis. Even before the storm clouds cleared the sharks were already circling, speculating on the outcome of the island’s bankruptcy, and pushing for the privatization of the electric, water and communications infrastructure. To them, Hurricane Maria is an “opportunity” to be used for its greatest advantage – to reap super profits from the exploitation of the Puerto Rican people. While Puerto Rico’s status as a U.S. territory and commonwealth makes its legal circumstances unique, its bankruptcy case is being monitored by U.S. states and cities like Illinois and Philadelphia that are confronted with similar problems. It is no accident that the one positive aspect of Trump’s response to the crisis, when he raised that Puerto Rico’s debt should be forgiven, was quickly abandoned by a White House ruthlessly carrying out its billionaire-backed agenda. What we are witnessing in the aftermath of Hurricane Maria are not simply “logistical difficulties.” It is Wall Street’s revenge on a nation and a people that have heroically fought back against austerity and refused to capitulate. Cancel the debt – Make Wall Street pay! Full, coordinated emergency response to the ongoing crisis in Puerto Rico. Public jobs and investment in basic infrastructure for Puerto Rico and cities across the U.S.
Full pay for those left unemployed or unable to work in Puerto Rico, Houston and in other areas devastated by hurricanes and inadequate federal response.